I visited my parent's home near Twentynine Palms, California, recently (in April 2018) and early last year at about the same time. I'll share some photographs from those two trips here as if I had taken them during a single day. For prints of any of these images, visit the Own Prints page, or contact me vie email at jon@jonberndtphotography.com. February 18, 2017, the headline in the Los Angeles Times read, "Monster storm breaks rain records at several Southern California locations". The afternoon before I had made a very long and traffic-congested drive from John Wayne Airport in Orange County to my parent's place near Twentynine Palms. On the morning of February 19th I got up early and found the "Dragon's Breath" shrouding the mountains south of Wonder Valley, with the storm system that had dropped record rainfall in southern California bringing humidity to the Mojave desert along with it. I thought this poem by Sylvia Plath describes the desert nicely. Settling into a few days of rest and relaxation, the above was my view from a chair from which I could see both the hummingbird feeders that are located nearby, lizards scurrying, and clouds drifting past casting shadows on the mountain ridges and canyons. A Costa's hummingbird (I believe) rests on a tree nearby the feeders. A Rufous hummingbird rests on a branch near the feeders, not sure what to make of me. A Costa's hummingbird (maybe) in flight. The hum of these birds can be startling! They sound too much like bumblebees! But they are fun to watch and a challenge to photograph in flight. From Audubon.org: "The desert might seem like a bad place for a creature that feeds at flowers, but it is the favored habitat for Costa's Hummingbird. In Arizona and California deserts, this species nests during late winter and spring, and most then avoid the hot summer by migrating to coastal California and Baja. The thin, high-pitched whistle of the male is often heard over desert washes in early spring." I have no idea what kind of lizard this is. A desert iguana? 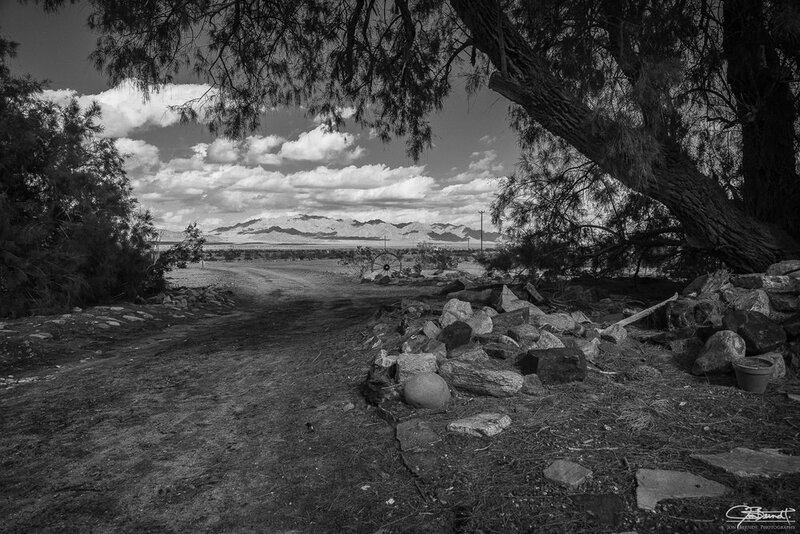 Twentynine Palms Highway - also known as Route 62. Looking east here. There's a good essay in the New York Times about this area. "In Wonder Valley, the silence makes its own kind of noise. 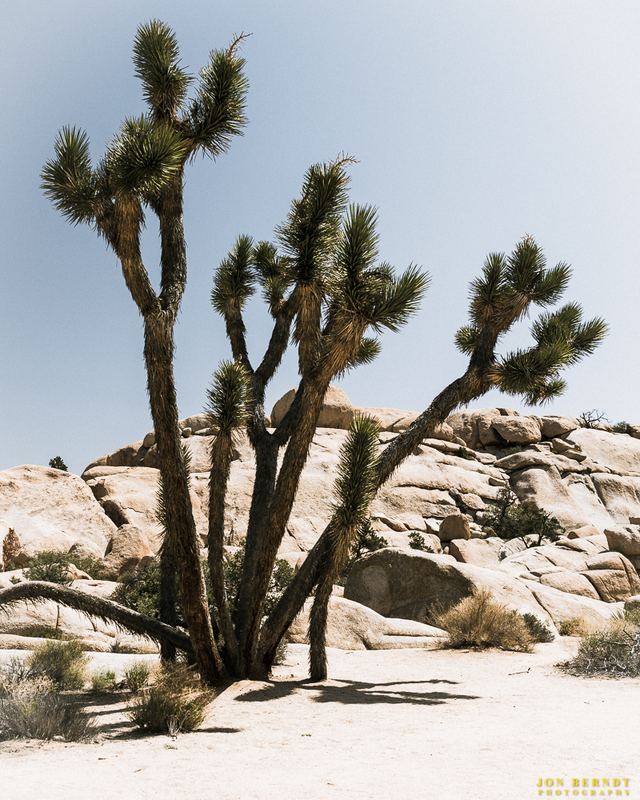 And Twentynine Palms makes its own kind of music." We hiked the Barker Dam Nature Trail (see below). Fortunately, the timing was right for my recent visit to photograph blooms on the Mojave Mound Cactus located along our trail. An unopened Mojave Mound Cactus bloom. This cactus is also known as the Claret Cup Cactus, and is the official state cactus of Colorado (my home state!). A Pencil Cholla cactus along the Barker Dam trail. Joshua Tree N.P. is home to two fox species, the gray fox and the kit fox. This is a gray fox. It was an unexpected treat to find this fox. I was walking along the nature trail and climbed up over a couple of large rocks to get a better view of some blooms that were off to the side of the trail and found this fox scampering out of view of people on the trail. In the evening on the way to The Palms restaurant I saw this rainbow. This was taken on the evening of February 18th, 2017 - the same day that began with the photograph at the top of this page with clouds hugging the mountains to the south of Wonder Valley. This rainbow is also seen looking south from near The Palms. I found this to be an interesting collection of "artifacts" outside The Palms restaurant. There is a very interesting art gallery just east of the city of Twentynine Palms called The Glass Outhouse. Yes, there really is a glass outhouse there, and it works! The Glass Outhouse features an eclectic collection of items that have to be seen. I won't try to describe them. The above photograph was taken of a tiny chapel built on the property. 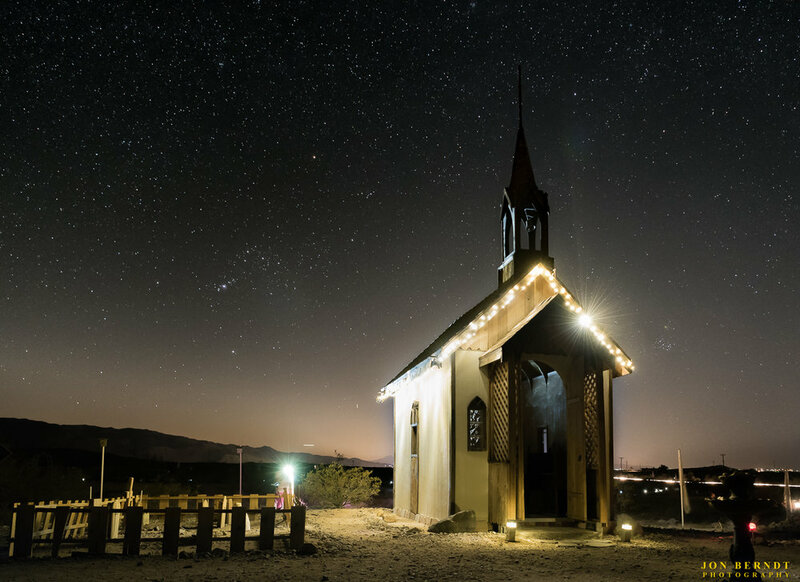 The constellation Orion is visible just to the left of the chapel. There is a "cemetery" to the left of the chapel featuring the tombstones for "Envy", "Greed", etc.